Samsung must have known it had a problem early in the Galaxy S5's run when most of the reviews called the phone "boring" or "predictable," while also conceding that it was a good device. 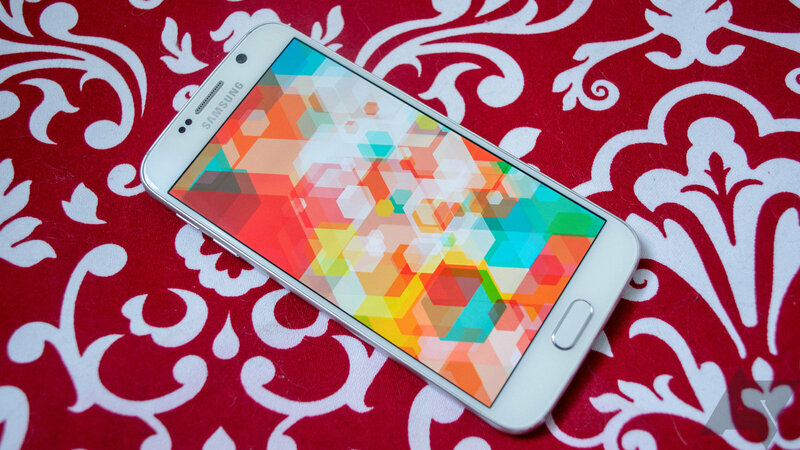 A good, predictable phone isn't going to sell like gangbusters, and indeed, the Galaxy S5 fell short of expectations. Over the next few months, we saw devices like the Galaxy Alpha and Galaxy Note 4 that played around with more premium materials and different designs, but the Galaxy S6 is the culmination of Samsung's plans to rehab its reputation. The Galaxy S6 is still distinctly Samsung with the oblong home button, big camera sensor, and industry-leading AMOLED panel, but it almost feels like it was made by a version of Samsung from some bizarre parallel reality where plastic doesn't exist. It's a phone I don't think any of us expected out of Samsung. Sure, maybe some more metal, that was a given, but no SD card? No removable battery? The Gorilla Glass chassis? This is a new phone for a new Samsung—let's see how it handles. Design This is finally a premium Samsung phone that feels premium. Fingerprint sensor The touch-based sensor under the home button works very well. It's worlds better than the swipe version last year. 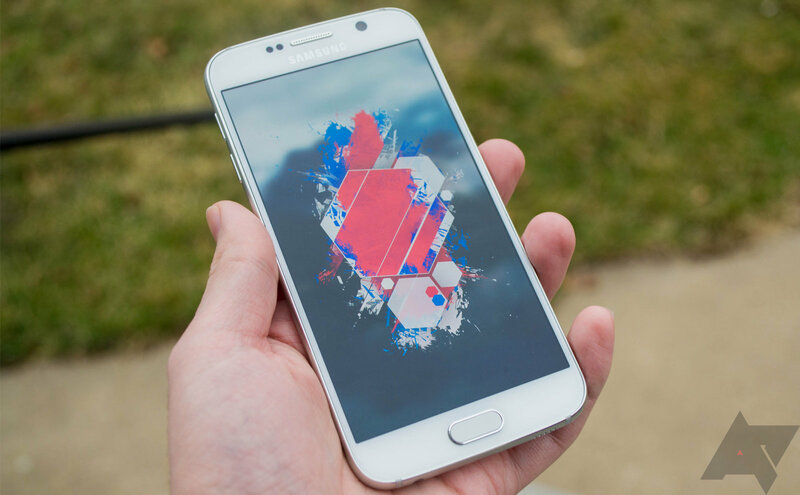 Display The GS6 has a stunning 1440p AMOLED screen. Maybe all the extra pixels don't matter, but the colors, viewing angles, and brightness are fantastic either way. Performance Almost always blazing fast, especially with that new UFS 2.0 storage. Charging Includes both wireless charging and fast charging over USB. 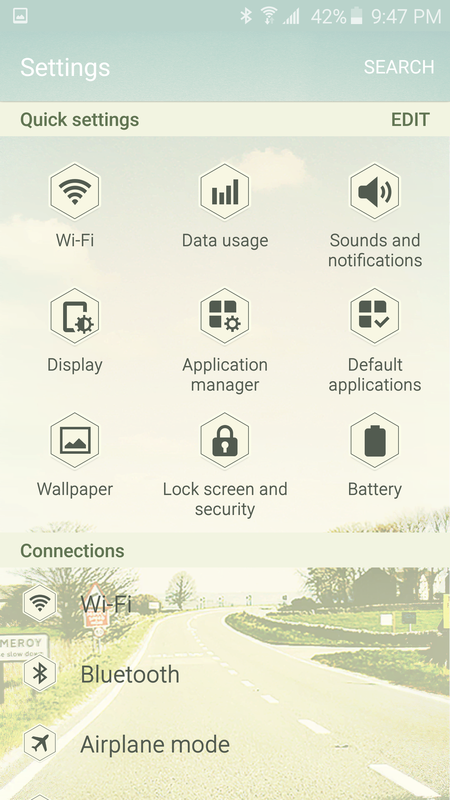 TouchWiz Samsung pulled a lot of mediocre features completely and disabled others by default. It's a much cleaner, faster experience. Camera Super-fast launch time and excellent photos. The new Pro photo mode is nice as well. 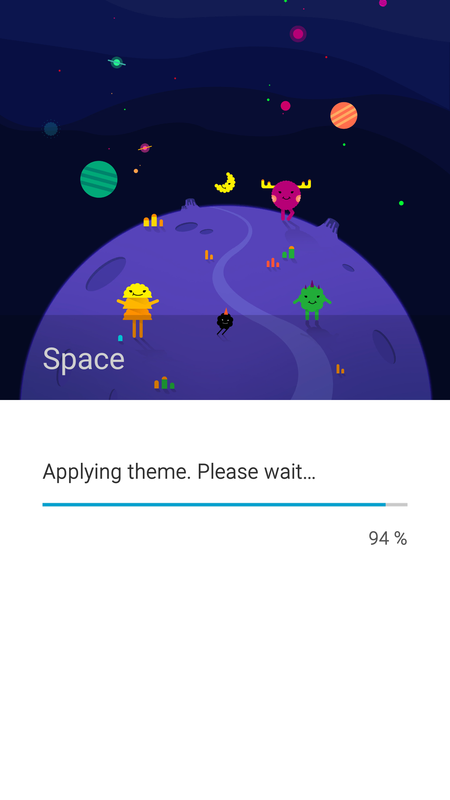 Themes While the themes right now aren't great, this feature has a ton of potential. Some performance hiccups Strange slowdowns in some places like the Briefing screen and scrolling widgets. No removable storage / battery You know... if that's a big deal to you. 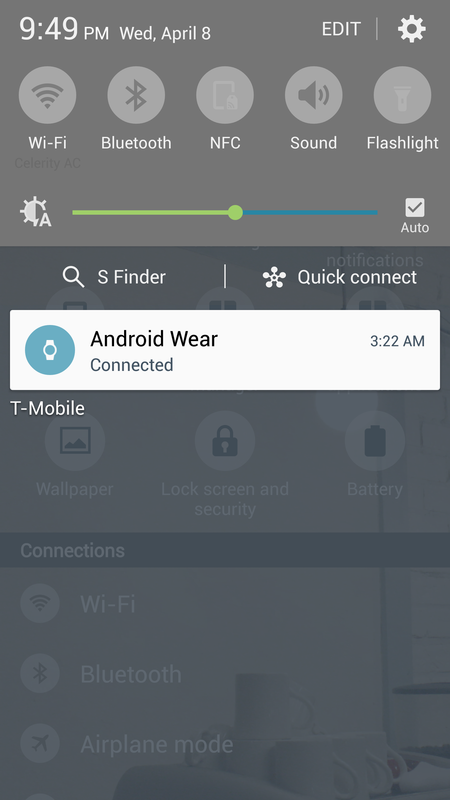 TouchWiz Again If you didn't like TouchWiz before, you still won't. There are a few annoyances, mostly in the launcher. Lots of slippery glass The Gorilla Glass 4 back shouldn't break when you drop it... but it is glass. 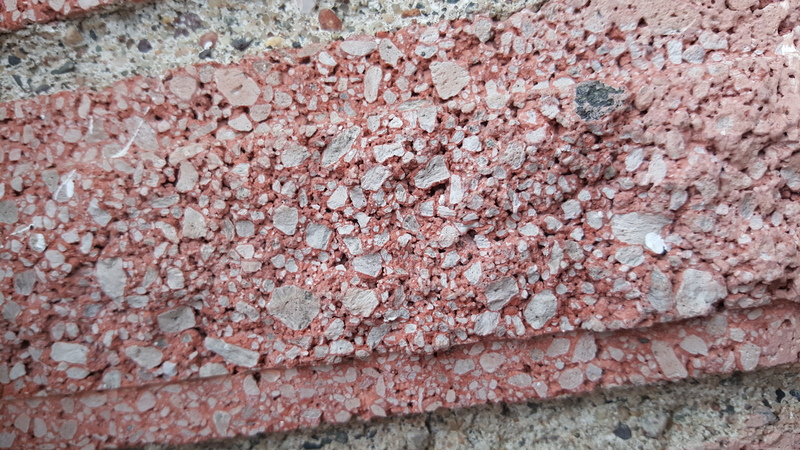 In the meantime, it will be covered with fingerprints. You have probably heard this from everyone who has touched a Samsung Galaxy S6, but it feels like an incredibly solid phone. It would be an impressive piece of industrial design for any OEM, but especially for Samsung, which has always seemed to take a "good enough" approach to design. I can't think of an Android phone that feels like a more premium piece of hardware than the Galaxy S6. In fact, I'd put this device up against an iPhone any day of the week. 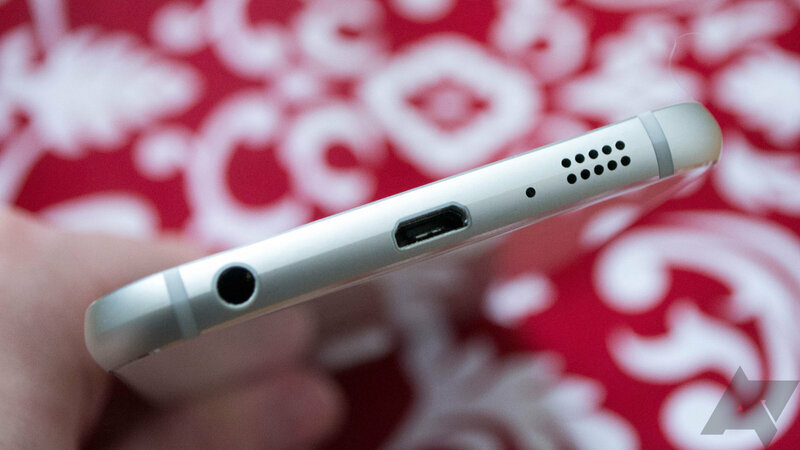 I can't think of an Android phone that feels like a more premium piece of hardware than the Galaxy S6. The front of the device is dominated by the 5.1-inch Super AMOLED panel, which I'll get into later. The bezels have been slimmed down dramatically this year, at least on the normal GS6. There essentially are no bezels on the Edge variant. The Gorilla Glass 4 front on the standard GS6 actually curves down ever so slightly at the edges to meet up with the aluminum band encircling the device (yes, it's metal instead of plastic with a chrome finish). There's zero gap between the glass and metal—it's extremely precise. I can't even slide a thin piece of paper in there. The back panel is non-removable and made of Gorilla Glass 4, just like the screen. It also tapers to meet up with the aluminum band. Some people have very strong negative feelings about phones with a glass back. It's another thing to break, sure, but it does result in a more premium-feeling product that won't interfere with wireless charging or cellular signals like metal does. A quick aside, I'm so pleased that Samsung built wireless charging into this device. Spending $30 on wireless charging backs for past devices was mega-lame. Also on the back are the flash, heart rate sensor, and the 16MP camera. The camera hump sticks out a few millimeters from the rest of the phone, which is common in Samsung devices. However, the completely flat glass back prevents any tapering to hide the magnitude of the camera plateau. It's probably the sloppiest part of the design in my opinion, not that it's a deal breaker or anything. Still, it irks me a little that the Galaxy S6 doesn't lay flat ever. The flat design isn't really ergonomic, like for example the Moto X, but the GS6 is thin and light enough that it's comfortable to hold. The speaker is on the bottom next to the USB port and headphone jack. It's fine, but this is still a tiny mono speaker with no bass. It gets reasonably loud, and it is much better to have it on the bottom rather than the back. Samsung has a track record of jiggly buttons of all sorts, but the tighter design extends to this aspect of the Galaxy S6 as well. The home, volume, and power buttons are all very stable and clicky. There's a tiny bit of rocking if you press on one end of the home button, but it doesn't feel loose. The buttons on the edge are all metal as well. 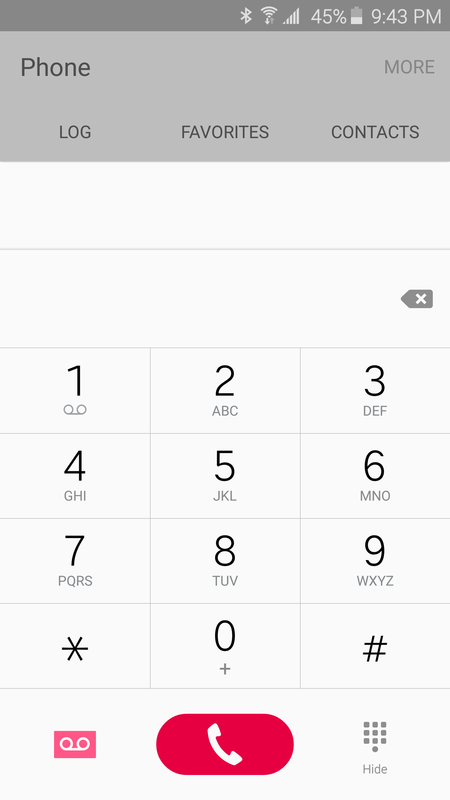 My only button-related complaint is that the volume toggles are a little too high up on the left side. Well, I'm also not personally sold on Samsung's physical/capacitive button phalanx, but the company doesn't seem likely to change that. I prefer on-screen buttons because they're easier to press. Samsung could at least put the multitasking and back button on the right sides, don't you think? 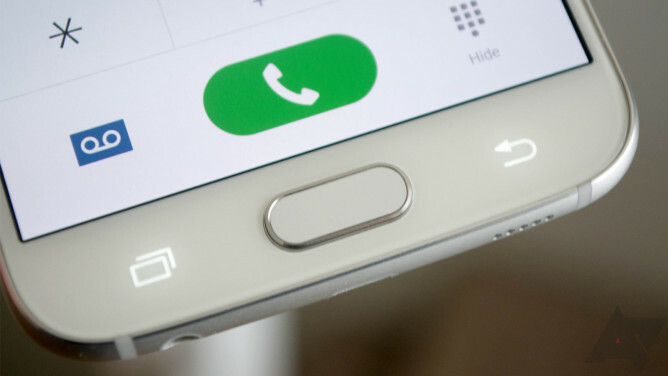 One of Samsung's big innovations for the Galaxy S5 was the fingerprint reader built-into the home button, and it was kind of a dud. By "kind of," I guess what I mean is it definitely was. The swipe reader on that device was extremely awkward to use and of little use beyond the novelty factor. 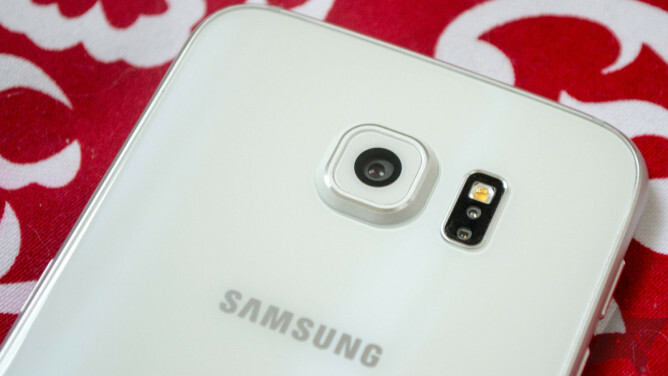 With the Galaxy S6, Samsung has finally gotten it right. The fingerprint reader is so fast it almost obviates the need for Smart Lock. All you need to do when using the fingerprint sensor is touch the home button. If you use the fingerprint screen unlock, you can literally just push the home button to wake the device and leave your finger there just a split second longer. That's enough for the phone to recognize you and unlock. The fingerprint reader is so fast it almost obviates the need for Smart Lock. The process of setting up fingerprints in the settings takes a bit longer than it did with the Galaxy S5, but you can register four fingers instead of three. Bottom line—Samsung killed it with the design this year. You pick up this phone and it feels substantial without being heavy. It's actually a few grams lighter than the Galaxy S5 despite all the metal and glass, probably due in large part to the more svelte design and yes, the smaller battery. We'll talk about that shortly. What about the Edge? 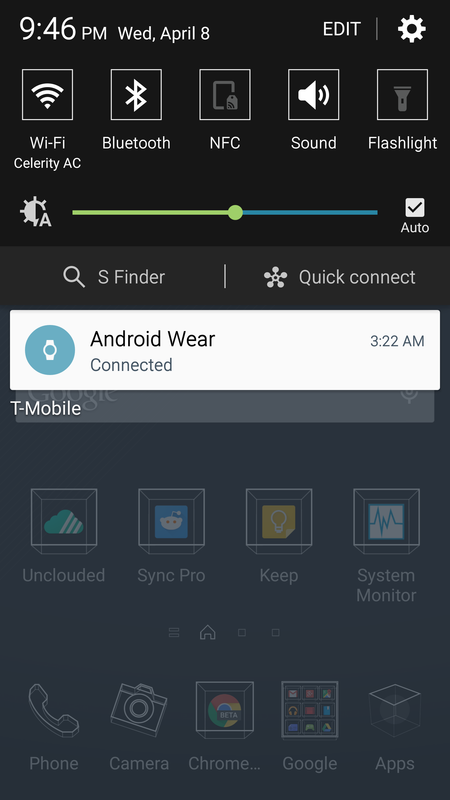 I don't have a GS6 Edge on hand to talk about yet. We'll probably update this review or post something separately if there's anything important to report once we do get one. This just in—Samsung makes really fantastic AMOLED panels. You probably know this, but the screen on the Galaxy S6 is truly a thing of beauty. It retains the same 5.1-inch size as last year's flagship, but the resolution has been boosted to 2560x1440. That's the same resolution as the monitor I'm writing this on, and that kind of blows me away. Samsung has slowly but surely erased all the shortcomings of AMOLED technology, and with the Galaxy S6 you can enjoy the fruits of those labors. Samsung continues to be years ahead of everyone else when it comes to displays. The Note 4 was the first Samsung device to make the jump to a 1440p Super AMOLED in 2014, but the Galaxy S5 was still 1080p. The GS6's increase in resolution has pushed the pixel density to a whopping 577 pixels per inch. It's debatable whether that makes a real difference on a smartphone, but I lean slightly toward the "okay sure, give me more pixels because why not" side of the argument. It's not going to be a night and day difference, no matter which side of the ideological divide you're on, but the Galaxy S6 doesn't suffer from the resolution bump like some devices (cough LG cough). Samsung continues to be years ahead of everyone else when it comes to displays. This screen gets incredibly bright when left on auto-brightness (over 600 nits) and can drop down to incredibly dim levels for use in a dark room (under 10 nits). This is one of the few devices I don't need to install an app that artificially dims the screen past the low point for use at night. 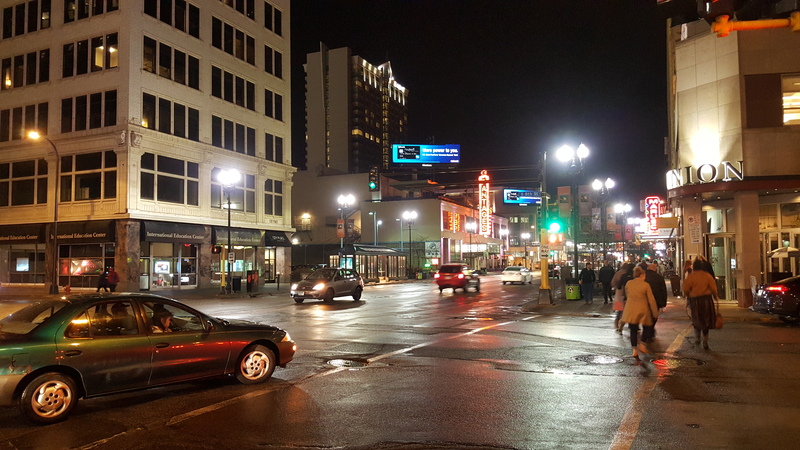 The colors also remain accurate at the lower brightness level. On the Galaxy S5, the display would become noticeably purple when turned all the way down. Being an AMOLED, it of course has perfect black levels, and the viewing angles are great. Samsung again has several display modes on the Galaxy S6 including basic, photo, cinema, and adaptive. The basic mode does a good job of reproducing colors accurately, at least to my eye. Still, I rather like the slightly more vibrant look of AMOLED photo mode. Adaptive defaults to brighter colors with a slight blue-ish tone, then it adjusts in supported apps based on ambient light. This looks really good in bright light, but I'd say photo mode is the best one. Really, though, there is no way to make this screen look bad. 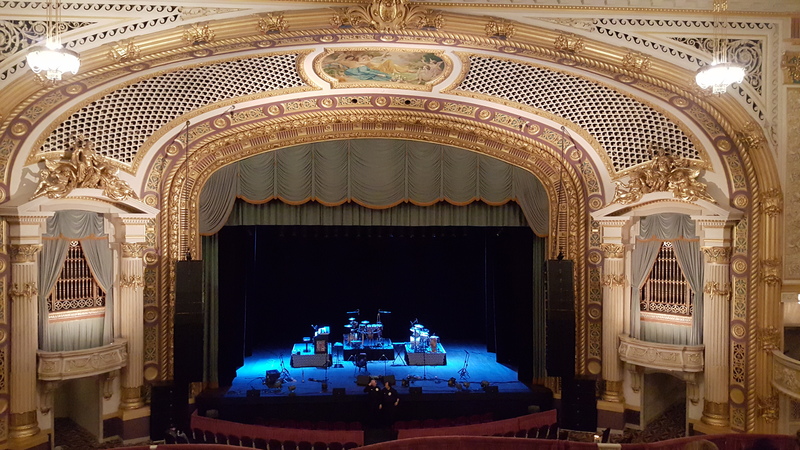 It's rapturously gorgeous. Samsung kicked up some dust with its decision to go with an in-house 64-bit Exynos chip instead of the Qualcomm Snapdragon 810. This was allegedly because of heat issues, which surely embarrassed Qualcomm in the run-up to spring phone season. It has been a few years since Samsung released a phone in the US with an Exynos instead of a Snapdragon, but the Exynos 7420 is a good way to bring it back. This chip has an ARM reference big.LITTLE design with four Cortex-A57 (big) cores and four Cortex-A53 (LITTLE) cores. The chip is based on a 14nm manufacturing process that offers improved speed and thermal performance compared to most other chips on the market. The GPU is also an ARM reference design, the Mali-T760 MP8. The Galaxy S6 feels very, very fast in virtually every situation. The healthy 3GB allotment of RAM also seems to be more than enough to keep things from falling out of memory too quickly (yes, even on Lollipop). I'll expand on this a little in the software section below. The Snapdragon 810 is under fire for being too toasty, but it's not like the Exynos 7420 doesn't get warm. It can get uncomfortably hot when charging (especially wireless) or if the CPU has been cranking away for too long. It's not anything out of the ordinary, though. In fact, it gets less toasty than the Galaxy S5 did last year, at least in my experience. Running a few benchmarks in a row, I'm able to get the GS6 up to about 110 degrees Fahrenheit. Since some of you are probably looking for a direct number-by-number comparison, I ran a few benchmarks on the Galaxy S6, Nexus 6, LG G3, and HTC One M9. The first three have the same resolution, but different ARM chips (Exynos 7420, Snapdragon 805, and Snapdragon 801). The M9 is 1080p and running a Snapdragon 810. Here are the numbers for AndroBench (storage), AnTuTu (total system), and 3DMark (graphics). Note, the Nexus 6 is encrypted, but none of the other devices are. So, clearly that UFS 2.0 storage in the Galaxy S6 is stupid fast, which makes loading content quite snappy. The overall Galaxy S6 system score in AnTuTu clobbers everyone else as well. The GPU keeps up nicely with previous generation Snapdragons, but I'm not surprised it's a little weaker than the competition. The HTC One M9 bests it in the GPU test, but that's the only win HTC's flagship ekes out. 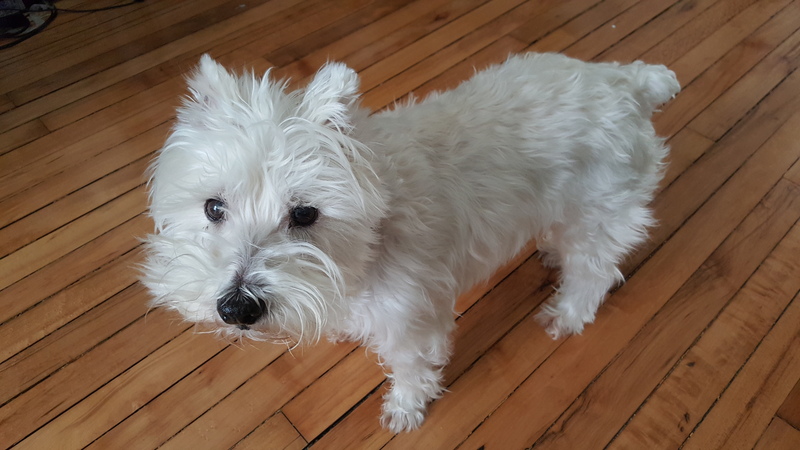 Most of Samsung's cameras over the last few years have been great, or at least very good. There were some issues with the Galaxy Note 4, but in the grand scheme it was still a very capable 16MP shooter, as was the Galaxy S5. The resolution hasn't been increased this year, but the Galaxy S6 still makes some notable strides in usability and image quality. The Galaxy S6 camera has optical image stabilization to reduce hand-shake blurriness and a wider f/1.9 aperture to improve low-light performance. About the low-light, I think this device improves noticeably upon the Galaxy S5, which suffered a bit in dimmer situations. It's sometimes inconsistent, but most of the images I'm taking in poor lighting turn out fairly crisp with very little grain. 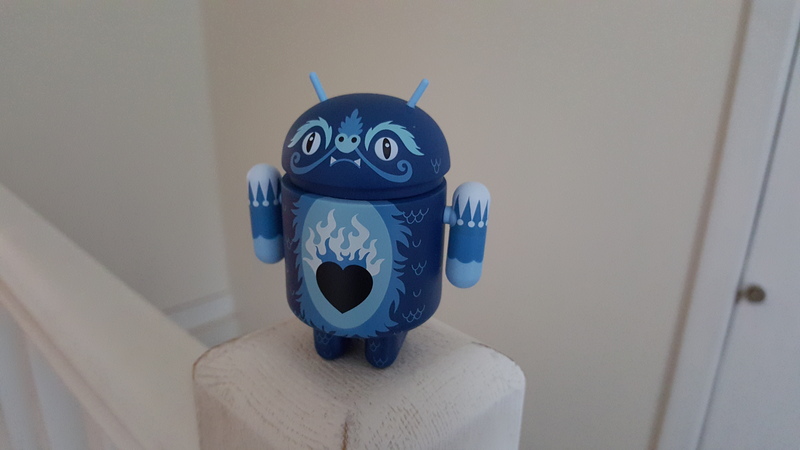 The image in the gallery below of the Android atop my banister was taken in a dim hallway at dusk. Looks okay, right? Both the Note 4 and Galaxy S5 could take a weirdly long time to open the camera app and get ready to capture, but Samsung is bragging about its sub-one second camera start up this year. That's definitely true if the camera has been used recently, but from a cold start I'd say it's slightly longer than a second. I'm splitting hairs, though—that's still great. 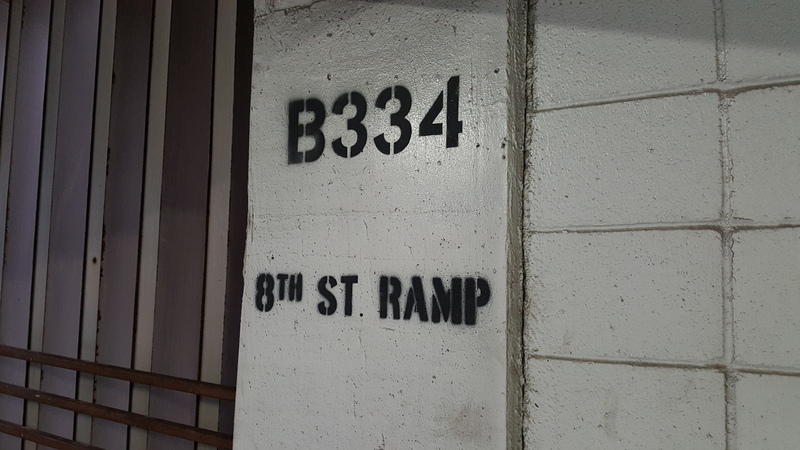 You can double-tap the home button to open the camera as well, and this works from anyplace. Yes, even if the phone is asleep. The full resolution 16MP images are shot in 16:9, but you can step down to 4:3 12MP snapshots if you prefer. As long as you're not planning to crop the files, you should be fine there. The video default is 1080p, but 4K is available too. You don't have to worry about capture time for video or stills. As I pointed out above, the GS6's internal storage lives up to the hype. Auto mode will do the job for most people, but Samsung has added a new Pro mode with a ton of options including ISO, white balance, manual exposure, manual focus, and metering. 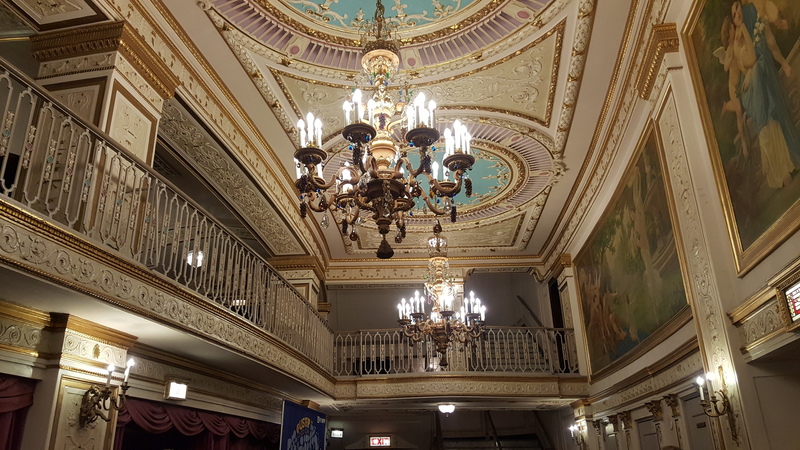 The live HDR preview mode lets you get an idea of what a shot will look like with and without that mode enabled, but capture speed is virtually instantaneous in either. 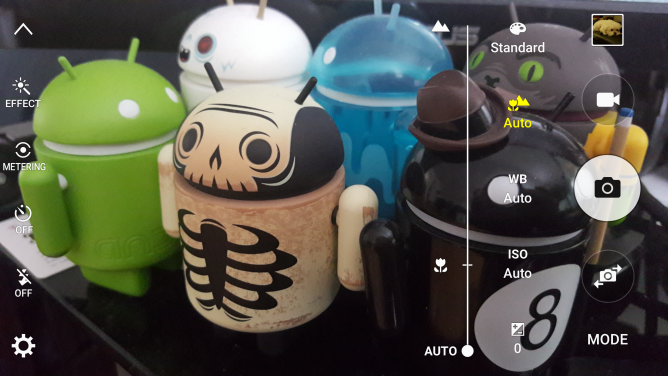 For the pickier out there, the Galaxy S6 even supports the Lollipop Camera2 API so you can find a third-party app to take full advantage of the sensor and save RAW images. 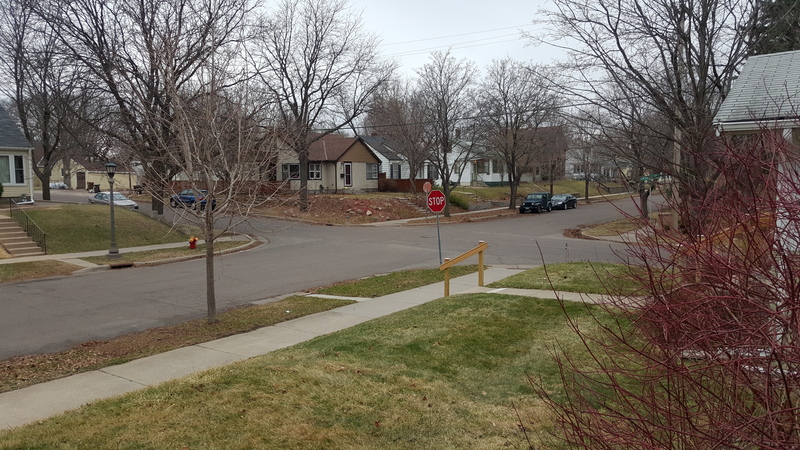 I don't consider myself excessively picky about image quality, but the image the Galaxy S6 spits out is at least passable, and most of the time it's fantastic. 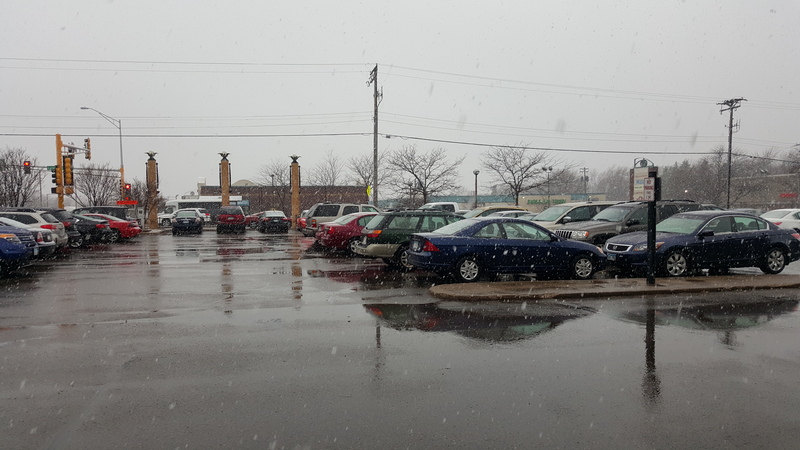 The combination of OIS and the wider aperture lens makes for excellent photos. 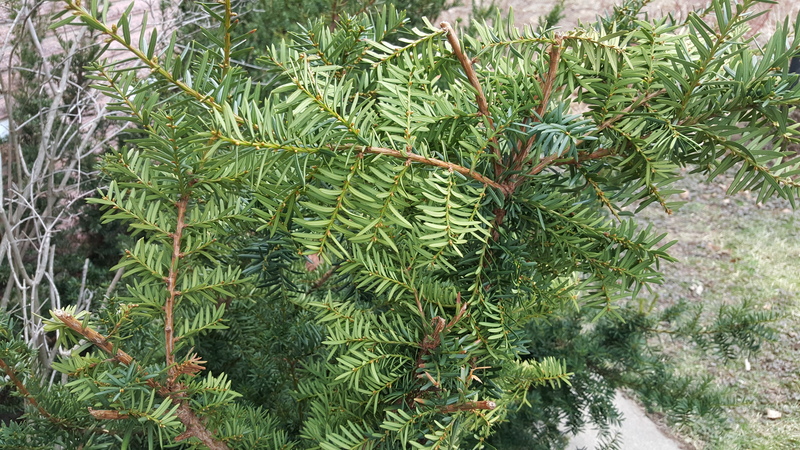 They have good detail, and Samsung avoids over-sharpening and excessive smoothing. Most phones have great sensors these days, so it's the software and processing that makes or breaks them. Samsung has that part figured out. 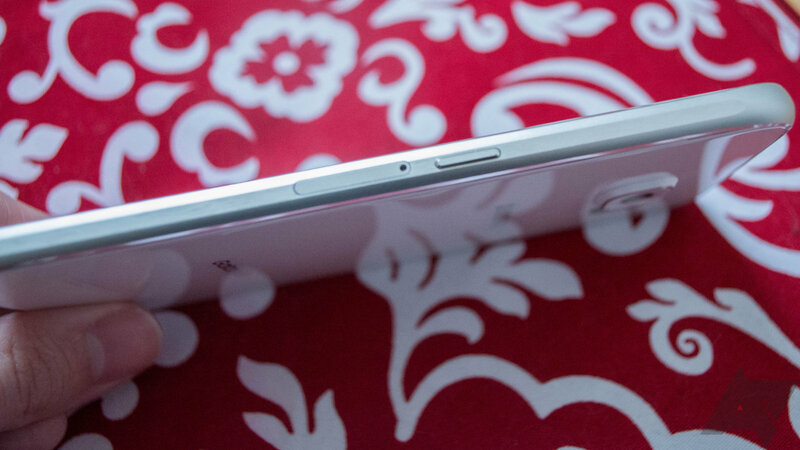 Possibly more contentious than the decision to ditch the microSD card slot is the lack of a removable battery. Some Samsung fans have gotten used to swapping in spare batteries when a charger isn't handy, or when the original cell starts to wear out after a year or two. That's much more difficult when you need to partially disassemble the phone to reach the lithium-ion cell. As such, battery life is more important than usual for the Galaxy S6 with its smaller 2550mAh capacity (2600mAh in the Edge). To preface, battery usage is a highly personal metric. 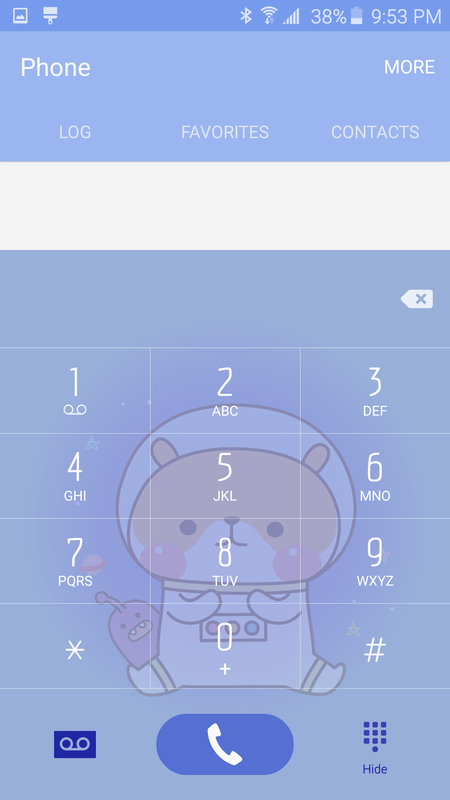 The way I use this phone might be very different from the way you use it. My idea of normal usage involves mostly WiFi connectivity, some LTE music streaming, ample messaging, several Google accounts syncing, and all location services on. 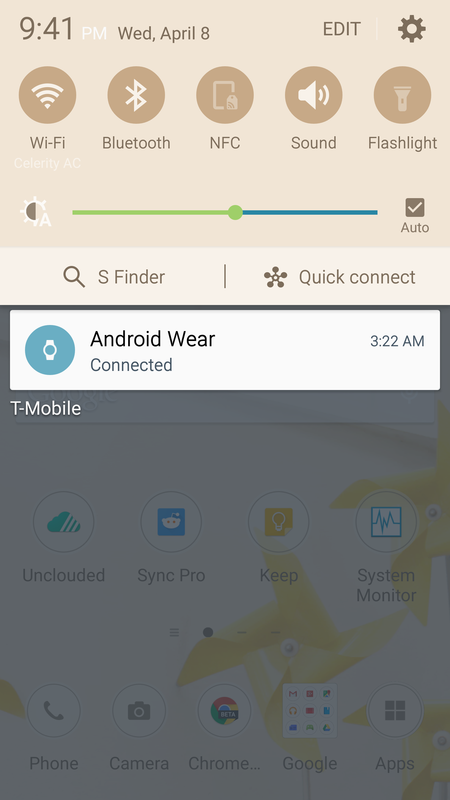 Additionally, I'm aware of some concern related to WiFi calling and VoLTE on T-Mobile possibly causing wakelocks and draining battery. To be safe, I turned those off. 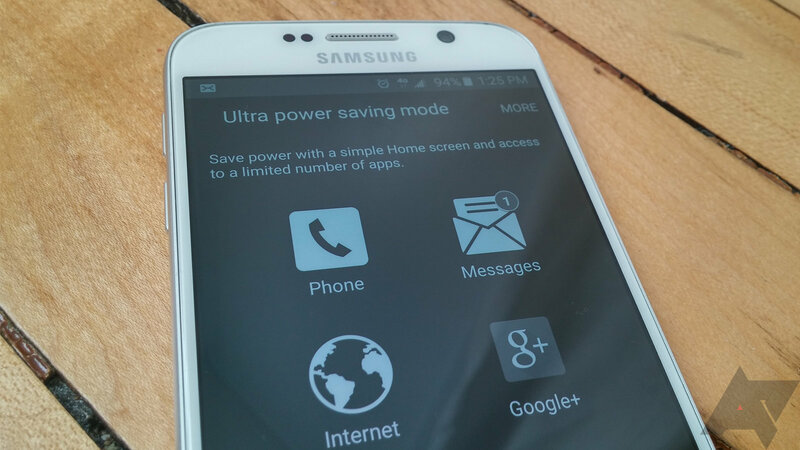 I also left the regular and ultra power saving modes off, though they are a useful way to scrape by for a bit longer. 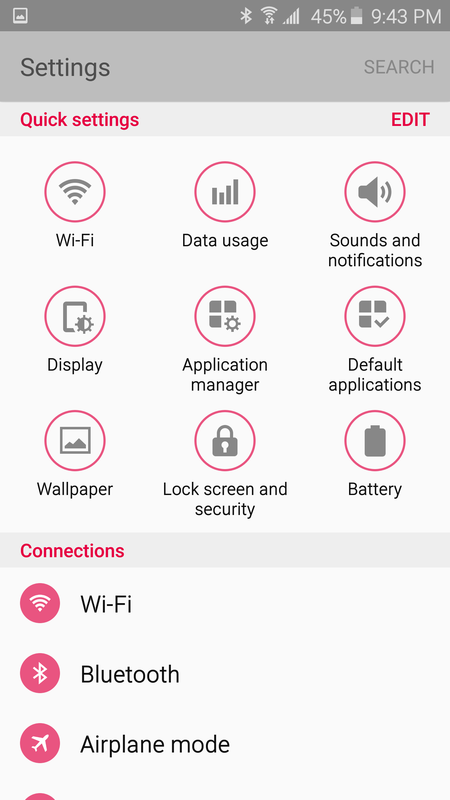 So what are my experiences with the Galaxy S6's battery life? It's... okay. I don't find myself with range anxiety when I go out, but I'm conscious this device is safe to use only for a single day without some time on the charger. Luckily the use of fast charging means you don't need to keep it plugged in for long. I don't find myself with range anxiety when I go out, but I'm conscious this device is safe to use only for a single day without some time on the charger. With light usage, it runs almost a day and a half with 2-3 hours of screen-on time. With heavier usage throughout the day, it'll be drained in about 18-20 hours with maybe 4-5 hours of screen time. This is about on-par with a lot of flagship phones, but it's probably 10-15% worse than the Galaxy S5. I suspect Samsung is using this as a differentiator to refine its product tiers in 2015. The Galaxy S series is stylish, slim, and offers one day of battery life. The Galaxy Note, meanwhile, comes with a much larger battery and a bigger screen. This is just speculation on my part, but I bet the Note 5 will continue to be the battery king in 2015. That's just not the market the Galaxy S6 is aimed at. So, yes, the battery life is problematic, but it's not a deal breaker for me. It's good enough. You are free to feel differently. There were rumors leading up to the Galaxy S6 launch that Samsung was going to go for a more stock look and feel. Well, that's not really the case. 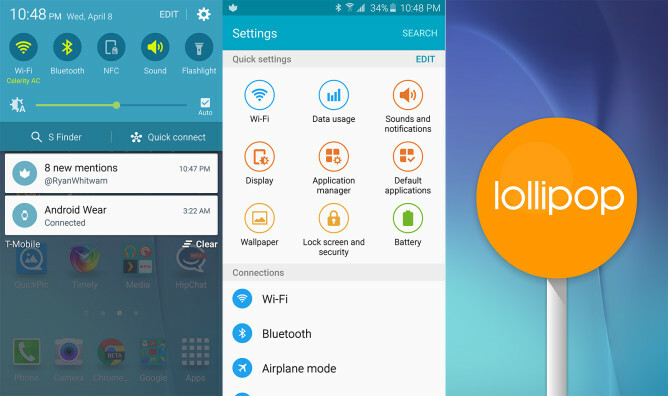 This version of Android 5.0.2 Lollipop is still clearly related to previous versions of TouchWiz, but there are some notable changes. Some of those are good and others not so good. The experience of booting up a Galaxy S6 for the first time is much less annoying than it was with the Galaxy S5. Not only are there fewer weird and unnecessary features enabled by default, there are fewer of them included. Things like Air View, toolbox, one-handed mode, high screen sensitivity, and others are not just disabled—they're gone. I'm sure the seven people who used Air View on the Galaxy S5 will be devastated. 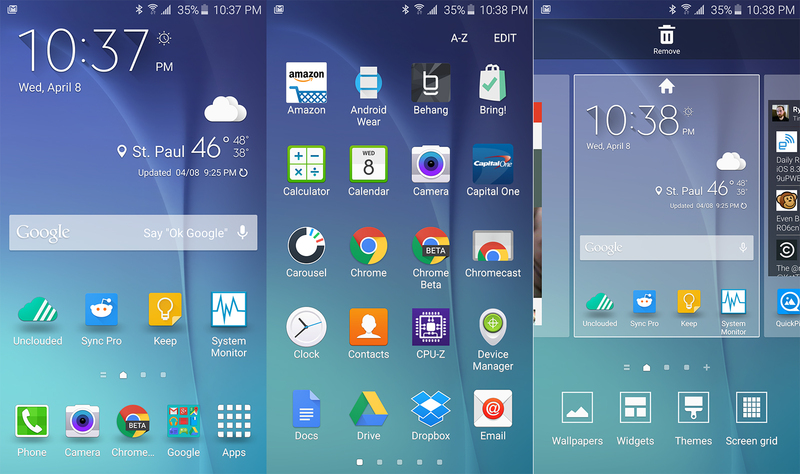 Most of the TouchWiz UI tweaks are still present. 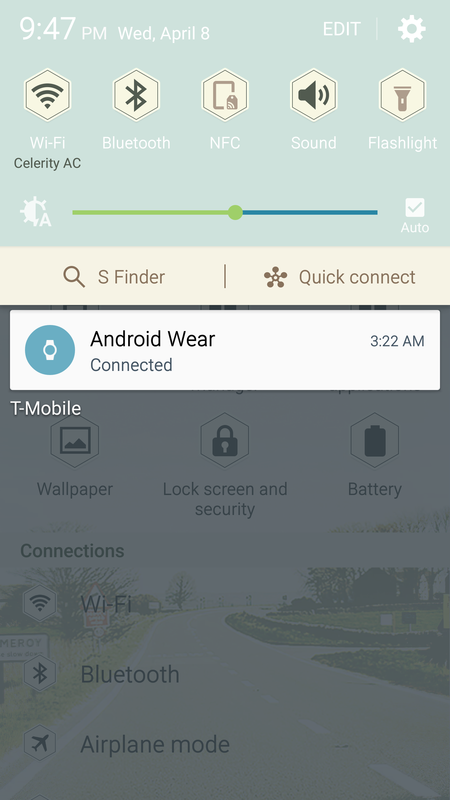 You're still looking at a light blue UI with green accents, but it's less garish than previous versions of TouchWiz. Also, that hilariously large screen of quick setting toggles has been done away with. 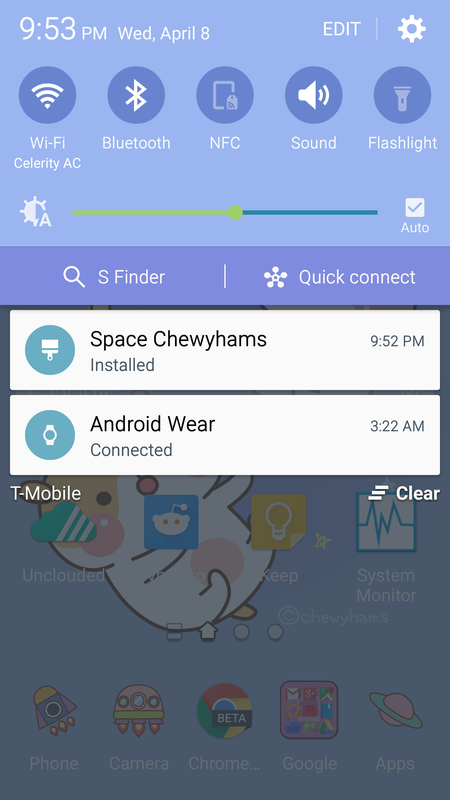 Now you have two screens of toggles in the notification shade and that's it. The (useless) notification buttons for S Finder and Quick Connect are still present, though. The settings look mostly the same, but everything has been condensed. That's mostly a good thing, but sometimes useful things (like Smart Lock, for example) are buried several layers deeper than in stock Android. The settings shortcuts at the top of the list help a bit with that. Slimming down the feature list is a great thing overall. There are fewer things running in the background and you don't need to go through and disable 30 settings just to use your phone. Samsung has adopted Android 5.0's priority notification scheme, but there's still a traditional silent mode option. 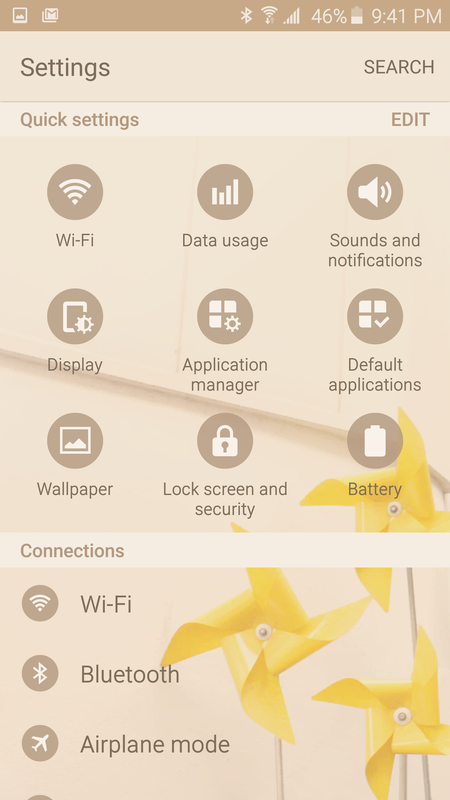 Samsung has adopted Android 5.0's priority notification scheme, but there's still a traditional silent mode option. It's actually kind of a strange hybrid system—the volume toggle can go to vibrate and silent, but there's no all/priority/none selector. 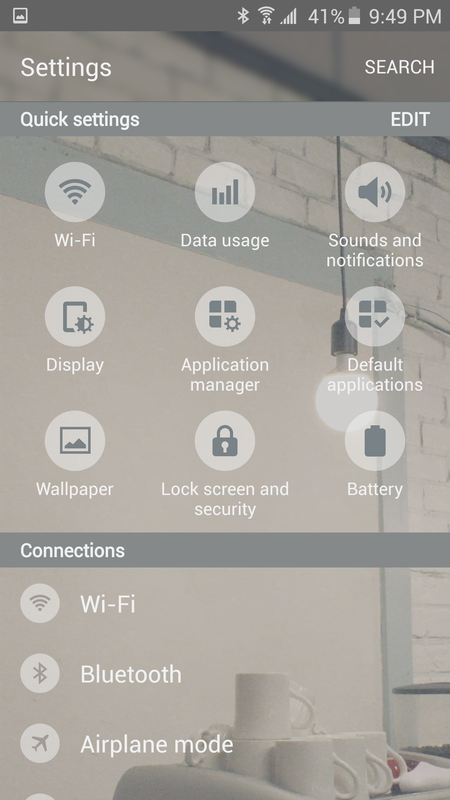 Those modes are all in the system settings under "Do not disturb" without the standard Android naming scheme. You can still set apps as "priority," though, which seems oddly disconnected from the rest of Samsung's terminology. Everything is still there, but it's weird that Samsung decided to do its own thing here. But hey, silent mode. Slimming down the feature set seems to have made the software on the Galaxy S6 quite stable. I haven't had any crashes or random reboots, which is more common than it should be with brand new phones. I've given this phone all I have by letting the Android setup process install a few dozen apps, but everything is going smoothly with no unusual wakelock activity. 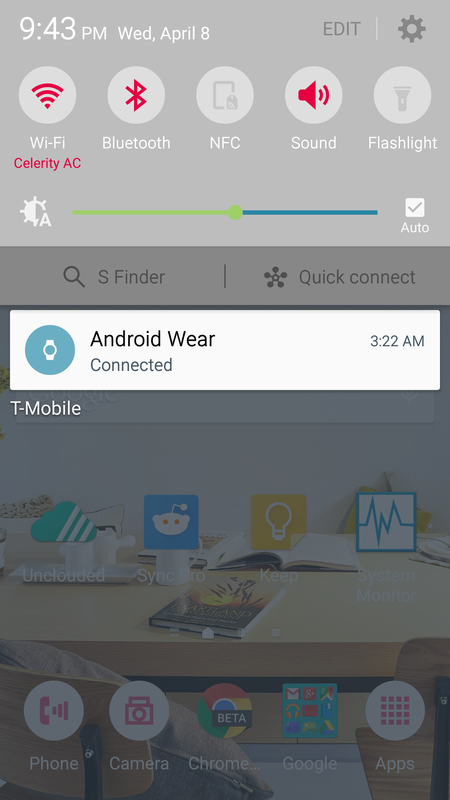 The Galaxy S5 had a nasty habit of staying awake for no real reason, but this phone seems fine. 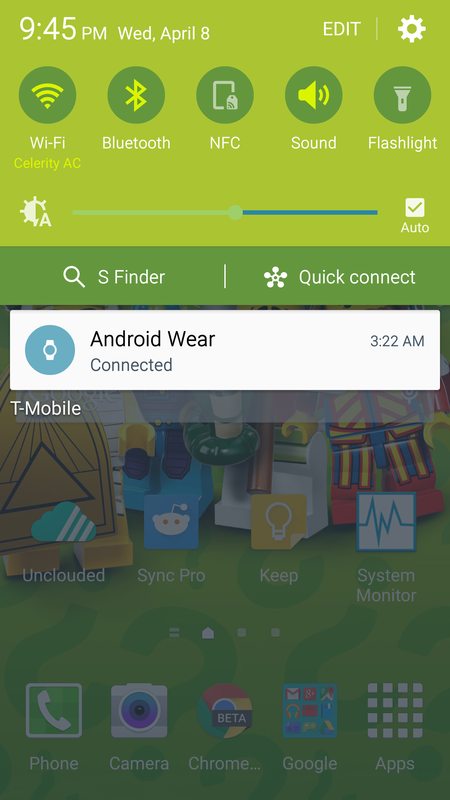 The GS6 has been running for a full week with no reboots or crashes. Switching apps is sometimes slow, though. 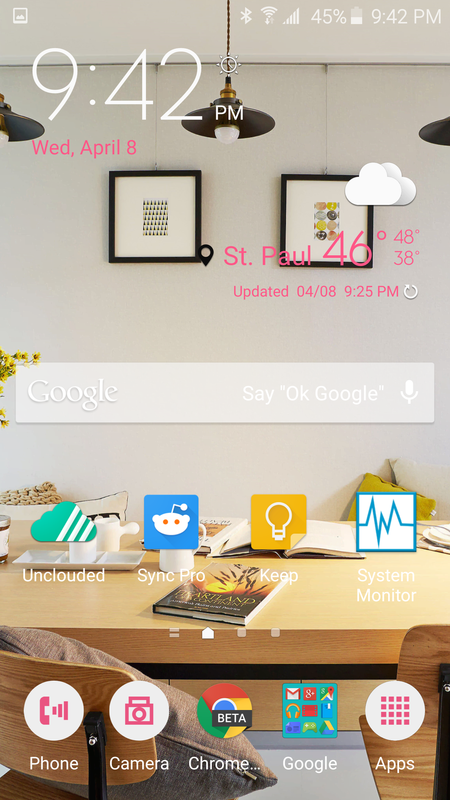 As for the TouchWiz home screen, I have not traditionally had much trouble with it. 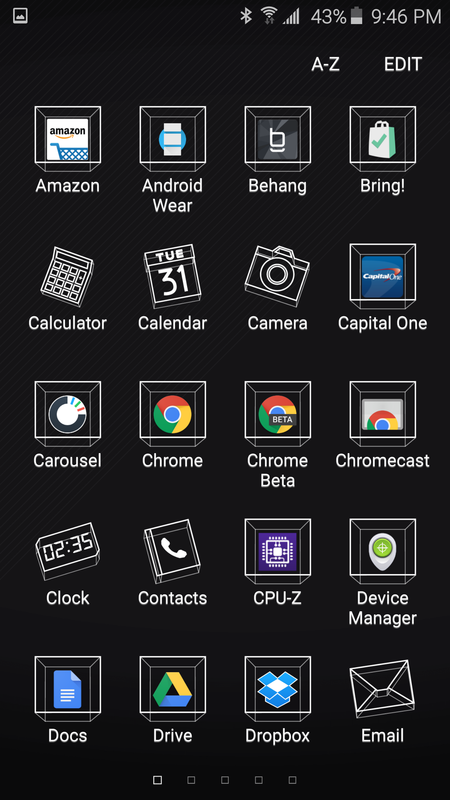 Well, I don't really like what Samsung has done with the home screen this time. For starters, the Galaxy S6 has a parallax effect that shifts the wallpaper around as you move the phone, a little like iOS. Every wallpaper image (included and third-party) does this on the stock launcher. I find it annoying, but whatever you can just turn it off, right? Wrong. There does not appear to be any way to disable this feature. Ugh. 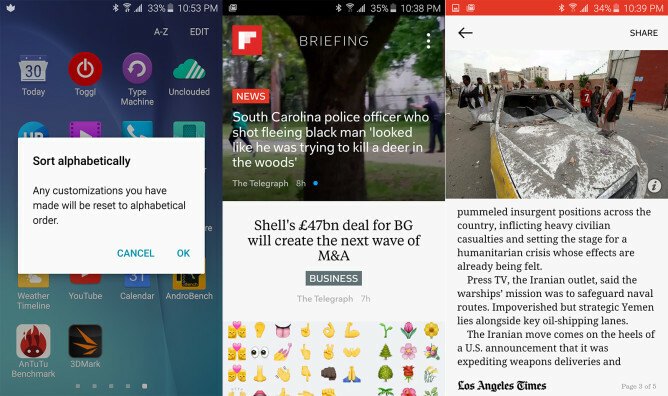 The My Magazine panel is back, but now it's called Briefing (as I believe it was on the Note 4). This Flipboard-powered news feed is on the far left home screen panel and acts like a poor man's BlinkFeed. I'm not opposed to the idea of having some sort of content over there, but Briefing is so laggy. This device feels incredibly fast almost all the time, but then you swipe over to the Briefing screen and the UI just stops for a second. Once you're there, Briefing is still a buggy mess that frequently fails to load articles. I would say Samsung still has some work to do here, but they just shouldn't bother. Luckily, you can turn this feature off. 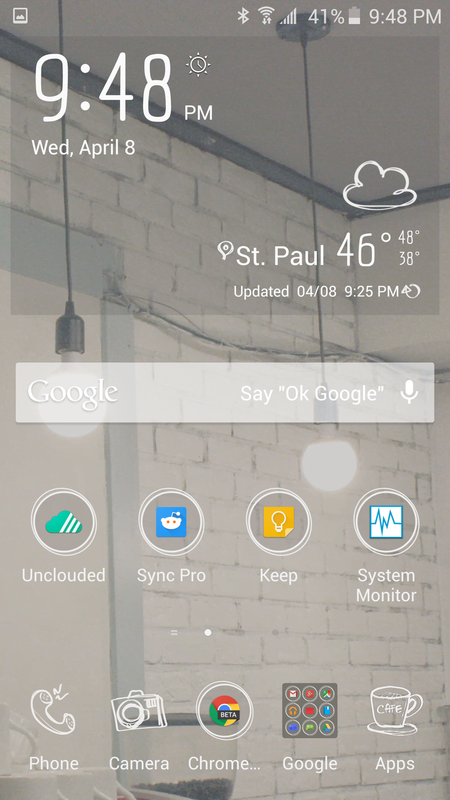 The app drawer also earns my scorn with its complete lack of consistent organization. It comes with a custom layout and folders, but even when you organize it alphabetically, it doesn't stay like that. New apps are tacked on at the end and removing apps leaves gaps on the various pages. 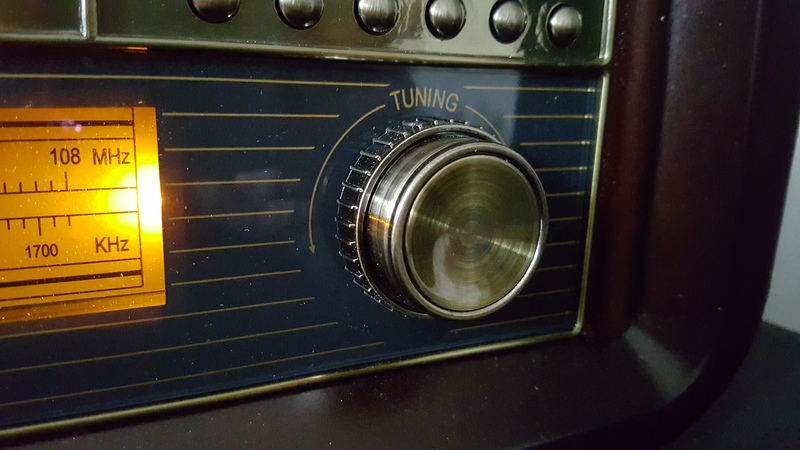 You can hit the A-Z button at the top to reflow it in the right order, but what? I don't even understand why they would design it like this. 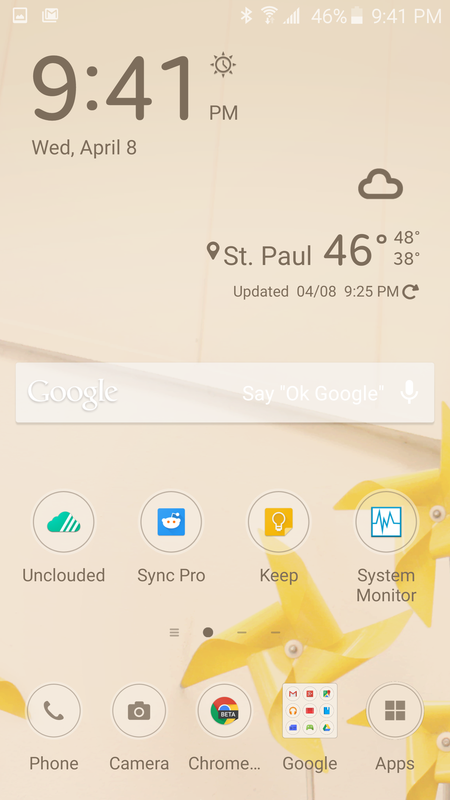 Another TouchWiz oddity is the way third-party widgets behave on the home screen. 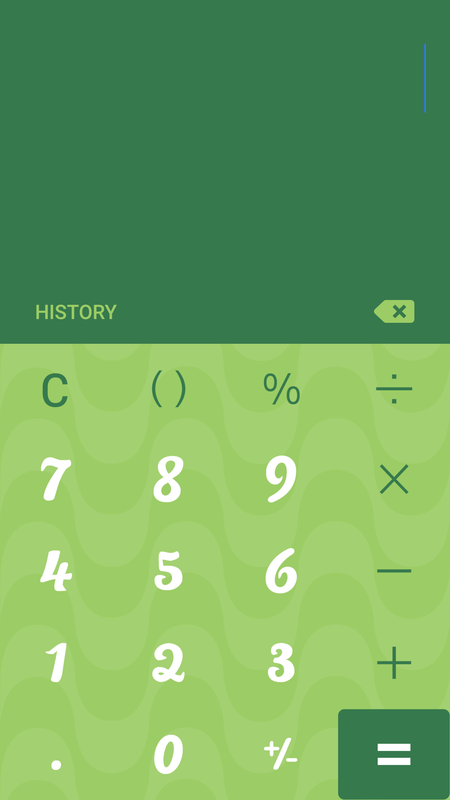 Scrollable widgets (i.e. Twitter clients, calendars, etc.) have extremely stuttery animations. 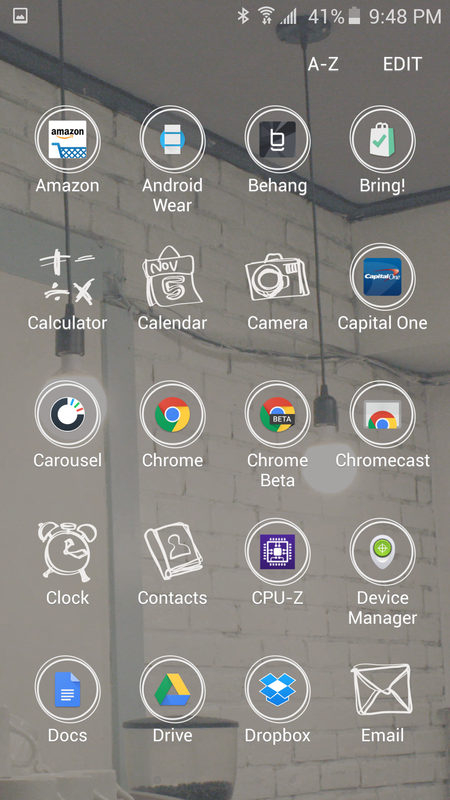 They work fine on other launchers, so I'm not sure what's going on with Samsung's launcher. This, along with the parallax thing, are enough of an annoyance that I can't see myself using the stock home screen going forward. If you're going to twist my arm and force me to say something nice about the launcher, well, it's cool that you can change the grid size to 4x5 or 5x5 from the standard 4x4. 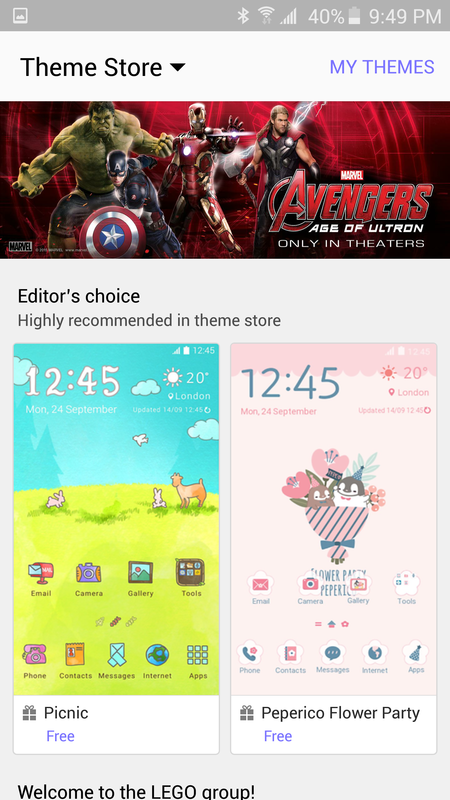 The widget list in TouchWiz is also excellent. 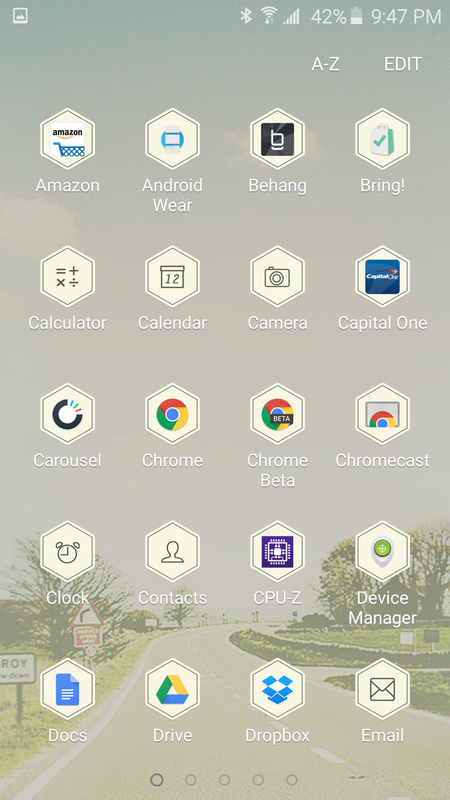 It groups all the widgets from an app into a single folder that you can select from. 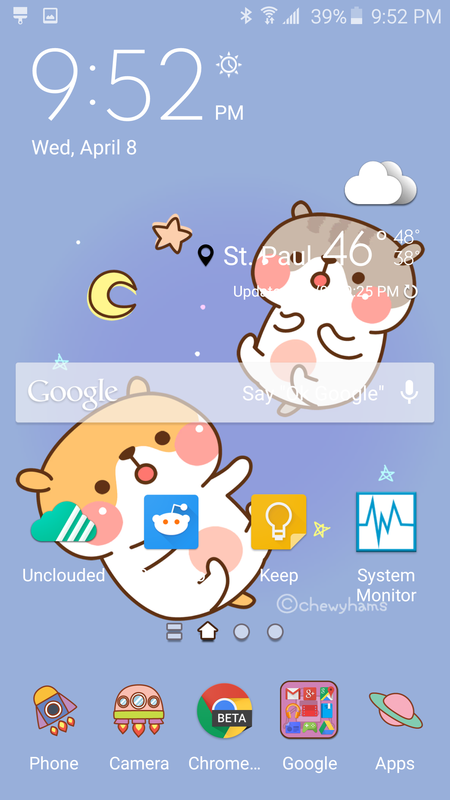 Samsung did make some questionable decisions with TouchWiz, but replacing the home screen alleviates almost all of my pain points. TouchWiz on the Galaxy S6 is overall faster, less cluttered, and more refined than it has ever been. Let's talk about the theme store for a moment. 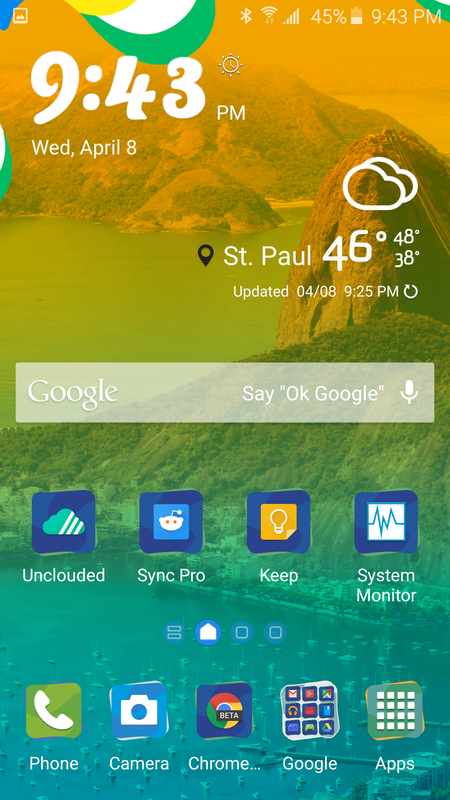 As I mentioned above, there are still some things about TouchWiz that aren't great, but maybe a theme could help? That requires the themes be good first, and thus far there are only a few that are even close to being acceptable. 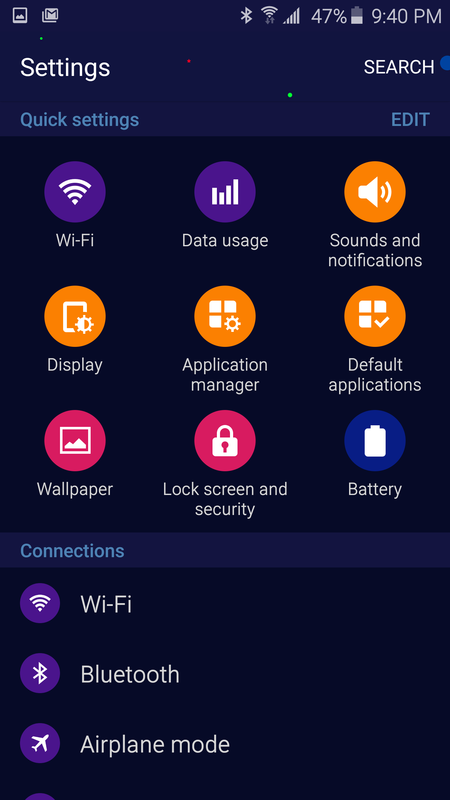 Samsung's themes are the whole package—ringtones, background, system UI, and icons. 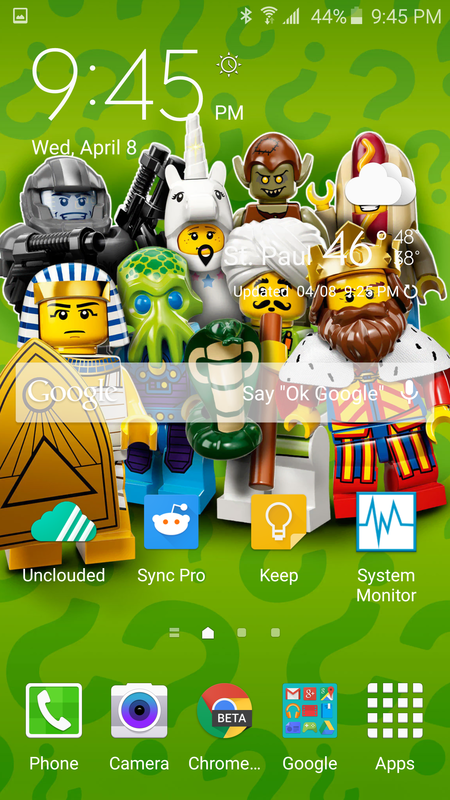 You can't choose individual parts of a theme to apply, but you can change the wallpaper or sounds after applying. A lot of what is included at launch are very over-the-top with ridiculous colors or cutesy characters. There are a few somewhat more understated options, but none of them seem completely baked. 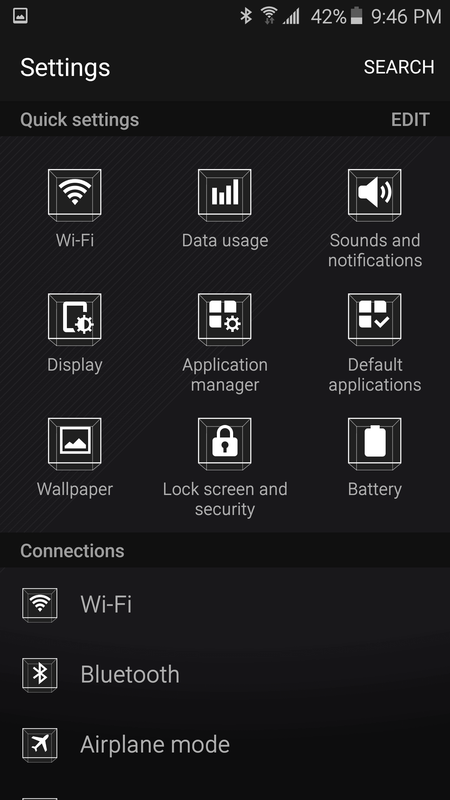 For example, the AMOLED-friendly Cogul Black theme has white wire-frame icons that are completely invisible in system dialog pop ups. 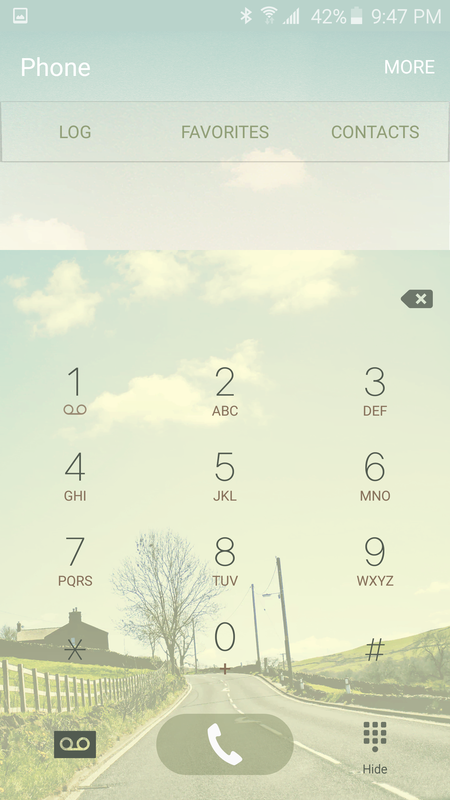 Many themes also include background images in the settings or dialer that make text harder to read. Here are some screens of the themes. It's not clear if Samsung is going to open this up or if it will tightly control what is allowed in. A batch of themes was added while I was in the middle of this review, so hopefully there's more to come. Everything in the theme store is free right now, but there's support for paid content as well. 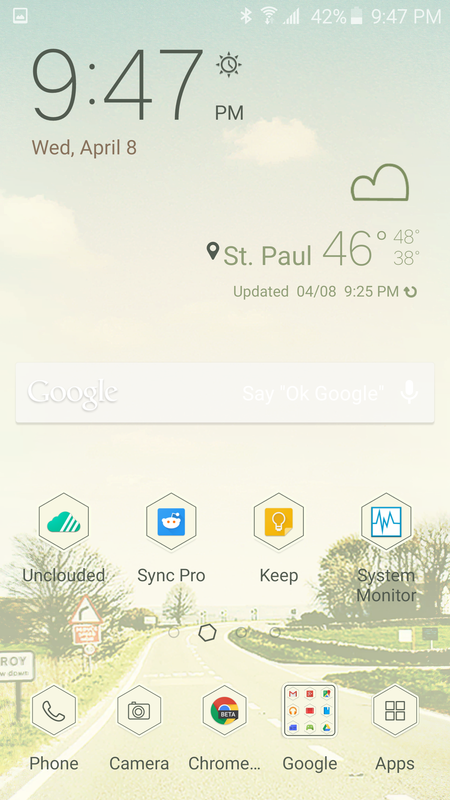 I would pay for a clean AOSP theme. Just throwing that out there, Samsung. 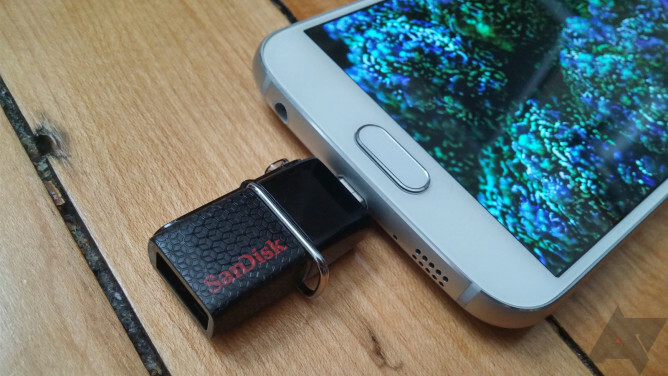 The Galaxy S6 is by no means a perfect phone, even if you're not a removable storage purist. The battery life is just average, the phone can be a little slippery, and the software still has a few hiccups. That said, this is the best overall Samsung phone in years, possibly ever. Sometimes I'm still caught off guard when I pick this device up because the build quality is so out of the ordinary for Android phones. Samsung really brought all its manufacturing experience to bear making a phone with such precise industrial design. It also got the fingerprint sensor right this time—it's actually a time-saver instead of a hassle. I was hoping the software would be better than it is, but it's not terrible or anything. Samsung's sense of design has improved over time, but it still clings to ideas that are not objectively "good." TouchWiz on the Galaxy S6 is definitely better than all of Samsung's past devices, but parts of it still feel vaguely lazy, and the performance issues on the home screen and in Briefing are unacceptable when you've got an octa-core processor behind the scenes. 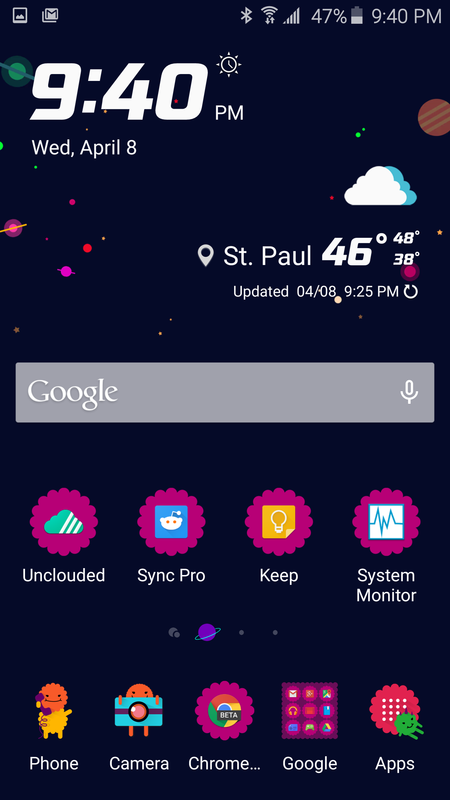 The theme store was profoundly boring when I first picked up this phone, but it's already showing signs of life. 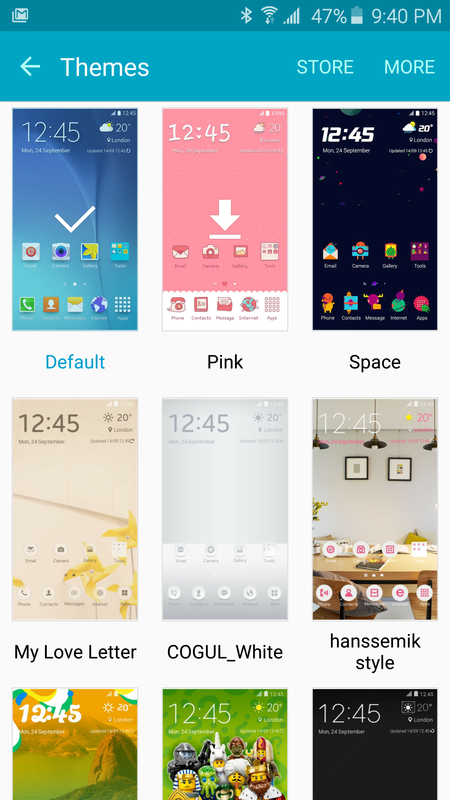 Samsung just added a dozen new themes, some of which are kind of good. If Samsung opens the store up to third-parties, it could become a great selling point that erases some of TouchWiz's shortcomings. 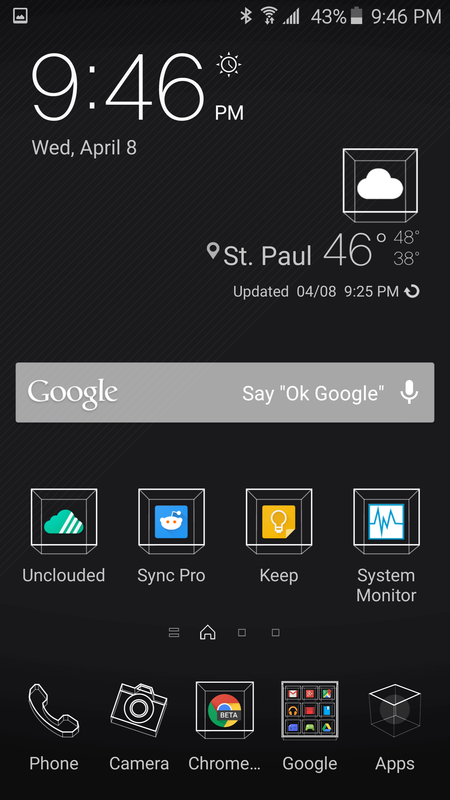 Someone just needs to make a clean AOSP theme and I'll be happy. 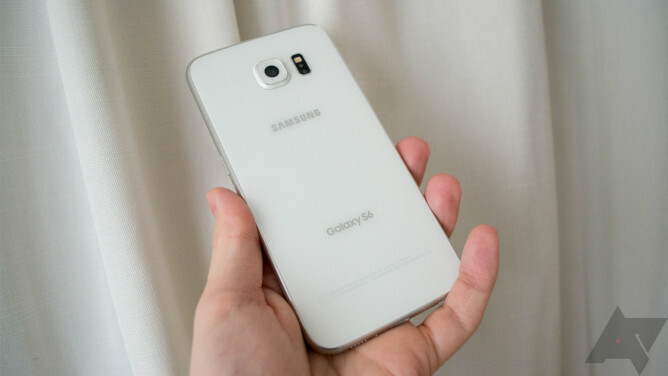 Even though it's not perfect, the Galaxy S6 is probably the best phone you can buy right now. It's not for everyone—if you need multiple days of battery life, look elsewhere. Otherwise, this is the phone to beat.